Rev. Jules Smith of Rising Star Missionary Baptist Church now presides over the largest congregation of any Black pastor in Colorado. The August dedication of the church’s new facilities, including a beautiful and expansive sanctuary with seating on two levels, reveals a Rising Star congregation that numbers more than 2,000. 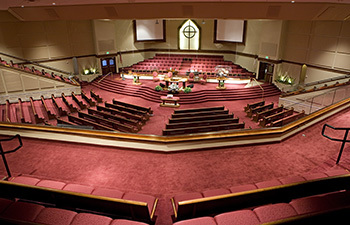 The new place of worship at 1500 S. Dayton Street in Denver, was the third phase of an $10.2 million campus expansion planned and brought to fruition over the past decade. The new facilities include a two-court gymnasium and a 50-seat choir room. When Rev. Smith took over as pastor in 1986, following the death of the former, Rev. George Brinkley, Rising Star had 33 parishioners on the roles. “I never will forget one Sunday I was feeling dejected and disappointed. While in preparation for the message on that Sunday, God whispered to me that he wanted me to preach and he was going to send workers into the vineyard. From that Sunday on I started preaching and God began the increase. “As Paul said, ‘We water and we plant but God gives the increase.’ And certainly that is what he has done. He has been faithful to his promise. I had a vision of expanding. God had shown me that we would be expanding. A plan developed that took the form of three phases. This last building is what we call the third phase, where we are now. In the first phase we built the Life Fellowship Center. That is where we held worship and had some administrative offices. Phase one is where we started and was not where we intended to remain because the vision that I received had indicated that we would be expanding. We completed Phase One in 1997 and then in 2000 we finished Phase Two which included additional educational rooms. Phase Two is called the educational wing because it provided space for the Sunday school classes. “After Phase Two we were not packing the place out but on occasion we were filling the place up. We did not want the same problem or be caught in the same predicament we were in when we were in the original building. In Phase One we got to the point that we were not able to accommodate our parishioners, people were turned away because of city code. We could not seat or accommodate any more people so we could not allow them to enter the building. We did not want that to happen and God provided a way for us to expand here to Phase Three. Pastor Smith was born in New Orleans and was raised in a town about 100 miles north of there called Saint Fancisville. That is where his wife, Ida, is from as well. Pastor and Ida Smith did not come to Colorado to take on a church. In 1982, the Smiths moved for a Jules Smith’s job, sales manager for Western Union Telegraph. He remained with the company until 1986. Before his tenure with Rising Star Missionary Baptist Church, Rev. Smith had joined the Union Baptist Church as an Associate Minister under Rev. Dr. Andrew Bowman. Under Pastor Bowman, he served as the instructor for the adult senior women Sunday school class and also as the radio commentator for the broadcast on Sundays. Pastor Smith was called to be the Senior Pastor of Rising Star after serving as an instructor for the Citywide Brotherhood. Rising Star has more than 50 ministries. The church does not minister just within the city. God has blessed them to do community work, foreign ministry, and work through out the United States. Ministries are available that reach everyone from the youth to seniors. Services are provided to nursing homes, ministries for youth divided by appropriate ages up to 18, a young adult group ministry, men’s ministry, single’s ministry, men’s Sunday school, combined co-ed Sunday school, adult women’s Sunday school, a young adult women’s Sunday school, brotherhood for men, three missions for the women which include junior mission, intermediate mission, senior mission, associate minister’s ministry, a minister wives and widows ministry, music ministry. As one can see, Rising Star has a variety of programs. Programs that are available include a preschool, a school that goes up to second grade which is called Rising Star Academy, senior’s ministry for 50 and over, a Crisis prevention and Intervention program which deals with human suffering due to alcohol or drugs or marriage problems. Rising Star does not offer counseling with those programs, but provides referrals and sources to help. As Sister Ida describes with passion the purpose of focusing on ministries is that, “We are not bound to the city but we have reached into the utmost parts of the world and that is what the Word has taught us to do to go into the “Utmost parts” of the world. Sometimes when a church grows, others leave and begin new churches and create divisions. Pastor Smith admits that several have left to start new ministries and churches but he describes a sense of joy when that happens, not division. “We are not what you call the ‘salt of the earth’, if too much salt is in one place on food it does not taste good at all, in fact you cannot eat it, but if you spread it out, it becomes very, very tasty. The new building has room for more than just worship The structure houses a gymnasium that includes an indoor walking track. The track is available to use for free to the community. The gym is available for rent to the community and can accommodate high school basketball games. The new space will allow the school to be expanded over several years to 8th grade. Activities occur nightly already. There will be concerts and other community events in the future.